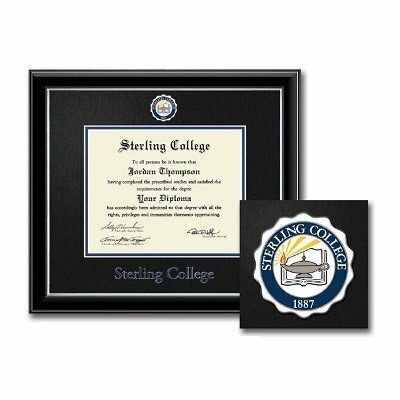 The Sterling College seal and word-mark are featured with vibrant color and added depth on satin black and red or blue museum-quality matting. Our industry-exclusive, state-of-the-art dimensional color process makes Sterling's marks pop! It is framed in Onyx Silver moulding crafted of solid hardwood with a high-gloss black lacquer finish and silver inner lip. This frame fits a Bachelor's degree.